Get ready to be transformed by the Word of God!! 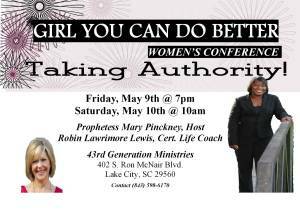 I’m speaking at this event this weekend with my friend, Mary Pinckney, of Lake City, SC and we are getting excited about how this is going to change your life if you attend. There is no cost to enter, just have an open mind and willing heart to understand and come to walk in the authority that God has already given you. As women, we many times feel misunderstood, misquoted, or blamed. Many things in life and in the world want to steal our rightful identity. When we are insecure in who we are, the rest of our life is like loose ends. It’s just hard to get things together. Previous Post You Can Win This Fight!